A view of one side of the jug. The pattern is one complete wrap-around pattern. A close-up of the tools. 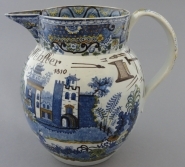 An earthenware commemorative jug printed in blue in the Boy on a Ram pattern, enameled overglaze in brown, green, ochre and yellow. Painted in brown is the name of "John Webster", the date "1810" and several images of blacksmith's tools including an anvil, bellows, nails, hammers and assorted forge tools.